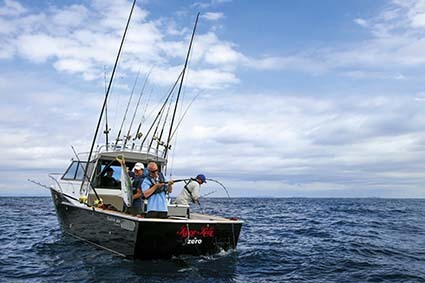 Trade-a-Boat tests some of the best trailerable fishing boats in New Zealand, including the Dickey Custom 850. Sure dreams are free but at Dickey Boats HQ in Napier, NZ, dreams can also be created. Lance Davis’ dreamboat started out as a twin-outboard Dickey Boats Custom 800. 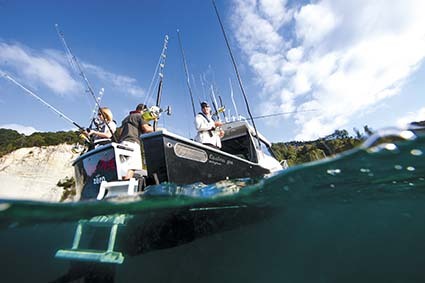 After the design process commenced it became apparent to customisation guru and serial problem solver Jason Dickey that Davis’ fishing bucket list would be best ticked off with the help of the Dickey Boats Sports Fish Transom and a compact, yet powerfully smooth 260hp Mercury Diesel 3.0L TDI. Dickey Boats builds its boats like small ships using its own Space Frame system, consisting of full interlocking ring frames, stringers, girders and longitudinals. This heavy-duty matrix is then encased within a 6mm aluminium hull with a relatively plumb bow and razor-sharp entry – a potent combination that maximises waterline length and parts waves with surgical precision for an impressively soft ride. In fact the ride is one of the many highlights for Lance: "It’s awesome. Once you learn how to trim the boat properly and let the hull do the work, its kind in all seas." Good design and exemplary build quality is then backed with a high-quality fitout to ensure long-term owner satisfaction. Indeed, Dickey Boats fabricates as many parts in-house as possible to ensure quality control and the availability of parts in the future. The impending arrival of Cyclone Lusi brought about complete destruction of our Kiwi Kings filming schedule and required a last-minute change in venue to Whitianga for part one – thank goodness for trailerboats. The Aussie crew consisting of Jack Murphy and Paul "Burf" Burfitt were flown in and treated to a solid three hours sleep before being kicked out of bed and chauffer driven to Whitianga under the cover of darkness. On arrival, the dream team stumbled out of the Holden Rodeo brimming with bad coffee and hash browns. The sight of two Dickey Boats being prepped almost brought a tear to tired eyes. Suddenly revitalised, the boats were launched and we headed out to load up on livebaits. Turns out we didn’t have to go far – within a few minutes the easy access transom livebait tank was full of XOS jack mackerel aka kingfish candy. With phase one complete, we put the throttle down for the 20nm run to the Aldermen Islands into a sloppy 1 to 2m of swell and chop which the Custom 850 ate up at a comfortable and dry 25kts. In fact, I sat in the cockpit for most of the trip and only caught a couple of drops, which bounced over the hardtop after we cut a green one in two. The Aldermen’s Pin was a hotspot on test day and we were getting smashed on almost every drop. Usually only seen in commercial tuna boats (of significantly bigger dimensions), Lance had equipped his Custom 850 with a mind-blowing Furuno electronics package: TZ Touch multifunction display, DRS4 Radar, Searchlight Sonar CH250 and both 38kHz 3kW and 200kHz 1kW transducers mounted in a custom-made housing. Out in the cockpit it’s all about having the upper hand and a snag-free environment when the line is screaming off the reel. 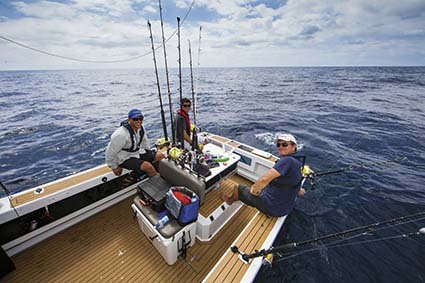 With excellent stability at rest, flush-mounted tuna tubes, thigh-height gunwales, 31 precisely-positioned rodholders, a self-draining cockpit and Dek-King synthetic teak underfoot the Dickey Boats Custom 850 proved the perfect partner to angling pleasure and mind-numbing pain. We fished five comfortably and had up to three anglers at a time getting dealt to by large kingfish. This is where the all-round footholds, absence of a boarding platform and full access to the transom proved invaluable. With around 20 solid kingies in the 15 to 22kg range released and a couple more on ice, no one could muster the strength to drop the last few surviving livebaits, so we trolled them while kicking back and hoping for a marlin to top-off an already epic day. As we’ve come to expect from Dickey Boats there are a few dazzling features that deserve a special mention. A remote control unit in the cockpit is linked to the second helm station and autopilot, allowing fingertip manoeuvring from where the action is. An innovative hand-wash system on each side of the hull is simply activated by leaning on a button with your knee. 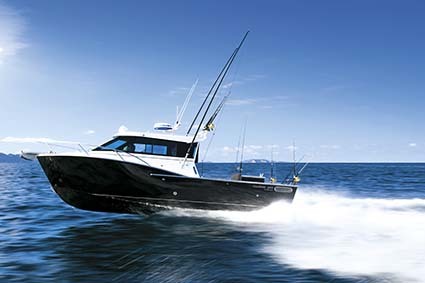 The Sports Fisher transom increases buoyancy aft and maximises cockpit volume. It also aids reversing ability when connected to a runaway Marlin with no boarding platform to dig in. In Transformer-like fashion a section of the transom also morphs into a heavy-duty boarding ladder that allows access while on the trailer. There are even non-skid steps on either side of the bowsprit for extra-safe docking. 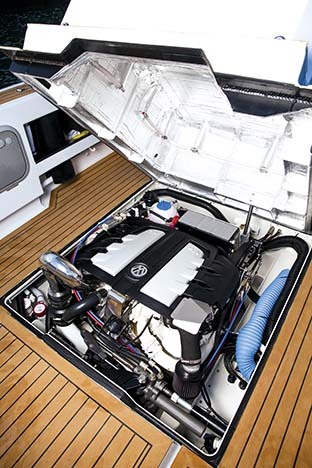 And last but not least the multitasking engine cover features stand-up storage for seven rods, a huge baitboard (with knife slots and towel holders) and four immensely handy tackle drawers. But what’s more, the bait station is removable to allow the Dickey Boats gamechair to slot in and rotate 360 degrees. While on board I described this boat as an engineering symphony and watching the electric actuator smoothly lift the engine cover to reveal the neat and accessible Mercury Diesel TDI engine installation only cemented that feeling. This level of form and function is no surprise given Jason Dickey is a marine engineer who’s worked extensively on superyachts. 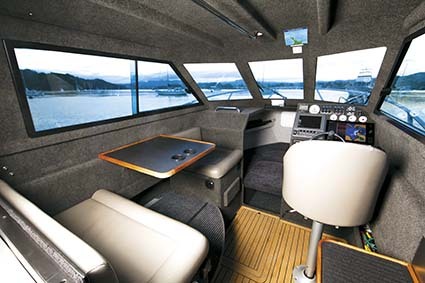 Of course all the usual hallmarks of a Dickey Boat are there as well – footrests (either fixed or fold-down) at each seat, a sociable and comfortable layout, a near seamless flow between the cabin and cockpit and maximised fishability. Throughout the build process the team were constantly monitoring the weight of the huge array of features fitted (including a 40kg sonar package and 45kg liferaft) to ensure the finished vessel met the target weight of 3.2 tonnes dry for towing. It’s also just on the road-legal 2.5m beam and with 450lt of diesel in the tank, Lance can venture far and wide in comfort, safety and style. As the sun set on our adventure, gamefish guru and editor Jeff Strang and I thoroughly examined our test subject. The verdict? Well the only thing we could come up with – that Dickey Boats haven’t already thought of – is the champagne. After numerous Dickey Boat reviews I’m also yet to meet an owner who wishes they had the benefit of hindsight. "Now that I’ve got my boat, I’m wrapped," said Lance. "Because we spent so much time talking through the design there was no confusion about the end game." Dickey Boats design process and custom wizardry really is the stuff dreams are made from. See the full feature in Trade-A-Boat #241, on sale June 5, 2014. Why not subscribe today? Find Dickey boats for sale.